My cousin's wife, Brenda, sent me this recipe. She has been making this for years. I love anything Italian and this is no exception. 1. For sauce, in a 2-quart saucepan cook onion and garlic in hot oil until tender. Add undrained tomatoes, tomato sauce, sugar, the 1 teaspoon oregano, the thyme, and bay leaf. Bring to boiling; reduce heat. Simmer, uncovered, for 20 to 25 minutes or until thickened. Remove from heat; discard bay leaf. 2. Meanwhile, cook pasta according to package directions; drain. Rinse shells in cold water. 3. For filling, in a medium mixing bowl stir together eggs, half of the mozzarella cheese, the ricotta or cottage cheese, Parmesan cheese, parsley, the 1/2 teaspoon oregano, and dash pepper. Spoon filling into manicotti. 4. Pour half of the tomato mixture into a 2-quart rectangular baking dish. 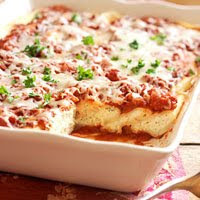 Arrange stuffed manicotti in the baking dish. Pour remaining sauce over shells. Sprinkle remaining mozzarella cheese atop. 5. Bake the stuffed manicotti, covered, in a 350 degree F oven for 35 to 40 minutes or until heated through. Makes 8 servings. Make-Ahead Tip: Prepare as above, except do not bake. Cover and chill in the refrigerator for up to 24 hours. Bake as above.